Removing multiple layers of wallpaper. Are you ready for your weekend wallpaper stripping project? Are you ready to remove multiple layers of wallpaper from your outdated bathroom? Times have changed. If you’ve got Brandy Bunch green wallpaper in your bathroom it can be embarrassing. At some point in the DIY process you have chosen to tackle the most difficult of tasks—wallpaper removal. Depending on how the wallpaper was originally adhered to the wall and depending on how many layers of wallpaper there are, this can be a relatively easy task or one that makes you want to tear the wall down and start fresh. 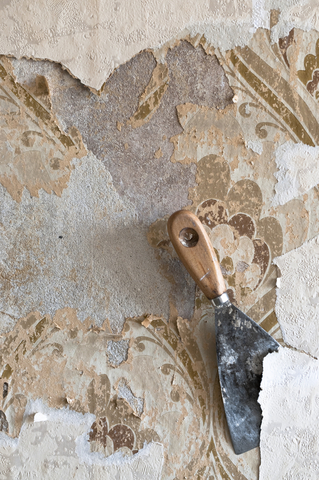 To begin the process of removing multiple layers of wallpaper, you will need a scorer. This is a tool that makes an indentation and enables you to make a break or cut in the material. The Zinsser Paper Tiger is a good choice as it does the least amount of possible damage to the underlying wall. You’ll also need wallpaper remover. This can be store bought or a DIY wallpaper stripper recipe. Protect your floors with old towels or other absorbent materials. The wallpaper stripper will run down the wall and possibly onto the floor. Protect your floors so you can apply ample amounts of wallpaper stripper without worrying about your floors being damaged. Another good tool for removing old wallpaper is a stiff sharp putty knife, 3-4 inch, or ice-scraper. An ice-scraper is lightweight which makes a big difference when you are standing on a stool with your arms extended to the ceiling. Your first step is going to be to score the wallpaper with a wallpaper-scoring tool. You will want to score lightly so you only make cuts in the wallpaper and not in the wall. You could use a putty-knife or razor knife, but the risk is higher that you will damage the wall beneath the wallpaper. You don’t want to damage the drywall! The cuts made by the scoring tool will help break up the waterproof barrier formed by the wallpaper’s finish and underlying layers of glue. This will allow the remover to penetrate into the underlying paper layer and soften the glue. Your next step is to apply a wallpaper remover to the wall and let it soak into the wallpaper to soften the adhesive. One trick for applying the wallpaper remover is to use a paint roller. You will want to soak the roller in your wallpaper remover solution and then liberally apply it to the surface. Reapply when the remover starts to dry. Allow this solution to soak into the wallpaper for 20-30 minutes, the longer the better. If the remover doesn’t seem to be doing the trick, try the steam method. For the steam method you can either buy or rent a steam machine meant specifically for wallpaper removal. Finally, to remove the wallpaper you can either use the ice scraper or a putty knife. Start at the top and work your way to the bottom. The handle on the ice scraper can make it a lot easier on the hands and arms to scrape the paper away from the wall. To remove multiple layers of wallpaper you might need to remove one at a time. When you apply the store bought or the DIY remover make sure you give it time to work and keep it wet. If more than one layer pulls away from the wall, that’s great. Just don’t expect it. There are many tips and tricks to removing multiple layers of wallpaper. It is definitely a weekend project from start to finish but with some good elbow grease this project can be accomplished with simple steps. What to do if last layer of wallpaper pulls of drywall paper? Wetting makes it worse! Stop trying to remove all the wallpaper. At this point only remove what is physically loose and prime the wallpaper. After the primer dries patch the damaged areas. There is paint between the two layers and some of it came off with ease. But now it is not coming off at all. Should I sand and paint with Kilz? I will be painting the walls in the end, not new wallpaper. Yes, sand and prime with Kilz. After it dries do your repairs, prime the repairs, then paint.